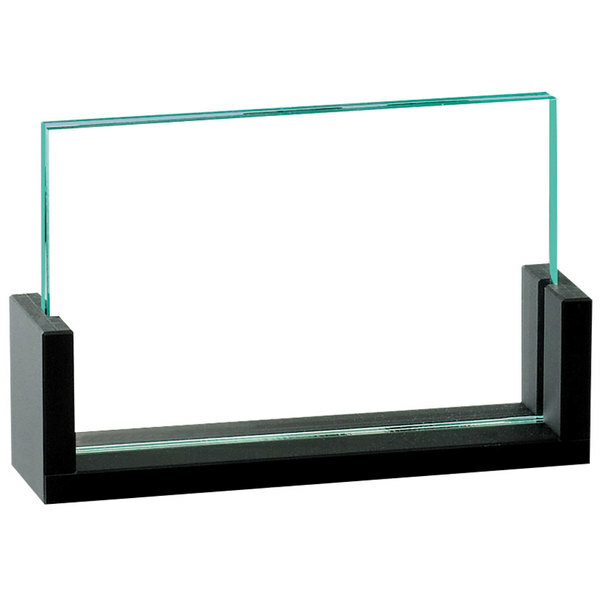 Insert Size 3 1/2" x 2"
This Cal-Mil 1510-32 displayette features a green edge acrylic insert and an intriguing "U" style black frame that draws customer attention to your food and drink specials, featured desserts, or exciting events. You can even use this versatile stand to mark reserved tables at your restaurant. This free-standing displayette has a compact footprint, saving you precious counter or table space, and the simple, attractive design is sure to be embraced by your patrons. The acrylic insert is removable for easy cleaning. Accepts 3 1/2" x 2" cards. This is a sweet card holder that works for many tasks! I have several of these that hold my custom made business card to promote my skills!! Beautiful frame! !